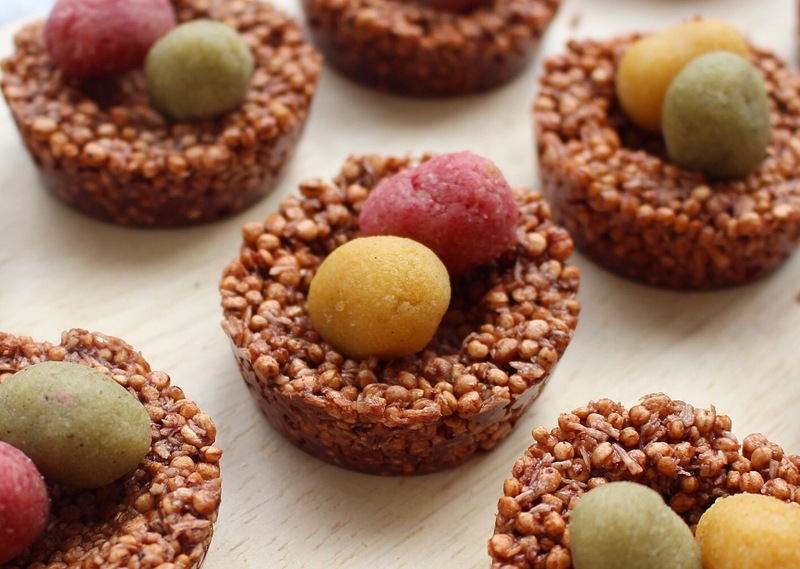 I used to love making Easter nests when I was little – my mum would melt the chocolate and then I’d get to stir in the Rice Krispies and spoon the mixture mostly into cake cases, but also some into my mouth. Some things never change – I still love making them, and I still manage to eat a fair amount of the mixture in the process. But these days I call it taste testing, so that makes it ok. Right? Having given up refined sugar, dairy and gluten, nowadays I don’t use Rice Krispies or store-bought chocolate any more, but my version is just as easy and just as yummy. You only need five ingredients to make the nests, and instead of topping them with Mini Eggs like I used to, I’ve created the most delicious marzipan eggs which are also dead easy and quick to make. I’ve used things like beetroot powder and turmeric to give the eggs some nice colours, but you could always use any other natural food colourings you might have on hand, or just keep them plain if you like – they’re just as tasty! 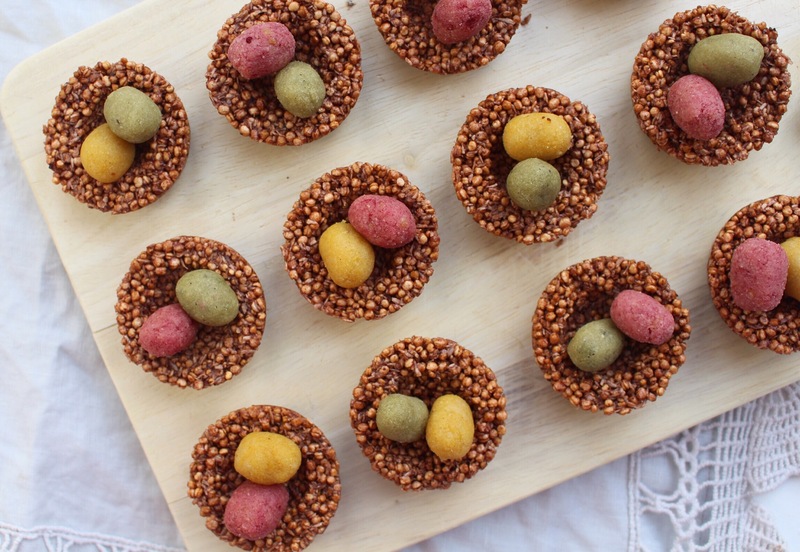 The marzipan works so well with the crispy nests too, it’s honestly a match made in Easter heaven! colourings (optional) – I used 1/4 tsp each of beetroot powder, turmeric powder and wheatgrass powder but you could use saffron, acai powder, spirulina, whatever you fancy! To make the nests, melt the coconut oil in a saucepan and then stir in the maple syrup and cacao powder until it’s all lovely and smooth. Pop the quinoa pops and dessicated coconut in a bowl and pour in the melted chocolate mixture on top. Give it all a good stir until all the quinoa and coconut is covered evenly in delicious chocolate. Now here’s the hard bit – TRY to get as much as you can into cake cases or small round silicon moulds without eating it all, then use your fingers or a small spoon to press down in the middle and mould them into little nests. Place them in the fridge to cool while you make the eggs. For the eggs, combine the ground almonds and maple syrup in a bowl and knead with your hands until they’re all mixed in together (it should be a play-doh like consistency). Separate this into three equal balls (or more or less depending on how many colours of eggs you’re making) and add a small amount of colouring to each ball, kneading to mix the colour in well. 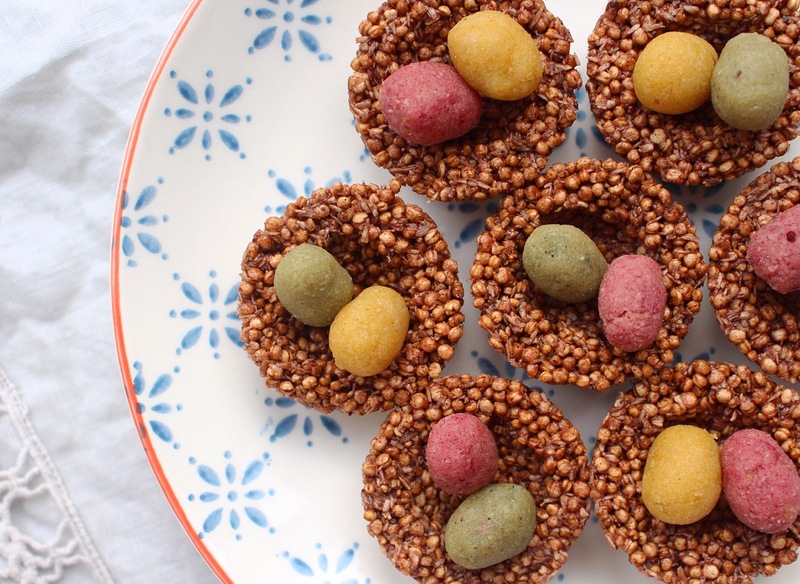 Shape the different coloured marzipans into little egg shapes and place them in your nests. Happy Easter!